Interview with David Hirsh in Konkret in German. In recent days the US polemicist Norman Finkelstein has injected a crude claim into the debate about antisemitism in the UK Labour Party: ‘the brouhaha is a calculated hoax — dare it be said, plot?’ This kind of denialism and victim-blaming is, of course, itself an example of contemporary antisemitism, and if the UK Labour Party listens to the counsel of Norman Finkelstein about antisemitism in its ranks then it really will have lost its way, and perhaps for good. [i] In response, Fathom is making available an extract from ‘Denial: Norman Finkelstein and the New Antisemitism’ a chapter by our editor Alan Johnson in Unity and Disunity in Contemporary Antisemitism, edited by Jonathan Campbell and Lesley Klaff (forthcoming, Academic Studies Press, Boston, 2018). The editors wish to express their thanks to Academic Studies Press for permission to publish the extract. We encourage our readers to buy the book. The other contributors areDavid Hirsh, the late Robert Fine, Kenneth Marcus, Dave Rich, David Seymour, Bernard Harrison, Matthias Kuentzel, Rusi Jaspal, Amy Elman, and Lesley Klaff. The concept of a ‘new antisemitism’ directs our attention to some of the ways in which some people talk about Israel, Israelis and ‘Zionism’, suggesting that these ways have left the terrain of ‘criticism of Israeli policy’ and become something much darker. [ii] The concept is concerned to distinguish between legitimate criticism of that policy (most obviously, of the occupation of the territories, the settlement project, the treatment of minorities in Israel, and the degree of force Israel uses to restore deterrence against Hamas) and an essentialising, demonising and dehumanising discourse which bends the meaning of Israel and Zionism (and most Jews) out of shape until they are fit receptacles for the tropes, images and ideas of classical antisemitism. We have no right to be disbelieving of this development. After all, antisemitism has never really been about the Jews, but about the need of some non-Jews to scapegoat Jews. As those needs have changed throughout history, the physiognomy of antisemitism has also changed. … read the rest of this piece by Alan Johnson, on the fathom website. 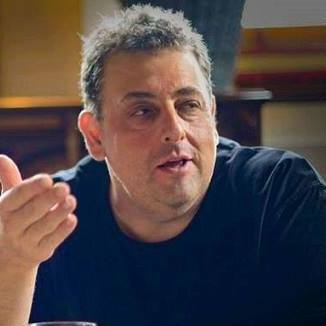 In 2015 Sizer had been banned by the Church from participation in social media after he promoted an antisemitic article on his Facebook feed entitled: ‘9/11: Israel did it’. Sizer did not need Jeremy Corbyn’s 2012 letter of support because he had been critical of Israel but because he had been strongly criticized by the Council of Christians and Jews for publishing antisemitic articles on his facebook feed from what the CCJ correctly described as “obscenely antisemtic” websites; and for persistently refusing to take the articles down when he was informed of the antisemitism issue with them. Jeremy Corbyn leapt to Sizer’s defence in 2012 and Corbyn has refused to re-assess this defence in spite of the issue being raised on many occasions since he moved into the centre of the public spotlight; and as Sizer’s more explicitly antisemitic material emerged, Corbyn remained silent. Antisemitic conspiracy theory has always portrayed Jews as working together, in secret, for their own selfish tribal purposes and it interprets the actions of each Jewish person as being dedicated to the whole secret Jewish collective. It sees a plurality of actual Jewish people, often disagreeing wholeheartedly with each other, and it makes out of them a fictional entity which may be called ‘The Jews’ or ‘The Zionists’ – this fictional entity acts as one against the interests of the wider community. It is true that currently there is an unprecedented consensus amongst British Jews, manifested in the diverse institutions of the Jewish community, that there is a problem of political antisemitism in the Labour Party and that it is related to the politics and political tradition of the Corbyn faction. The straightforward explanation for this is that it is true; and most Jews have been convinced that it is true by the evidence. But those who still support the Jeremy Corbyn leadership, in the face of mounting evidence that he is compromised by his association with antisemitic politics, need to find ever more elaborate ways of explaining what is going on. Sizer sees a consensus of Jews who agree, more or less on the central issue, and he sees a diversity of different Jews, and non-Jewish allies, writing, speaking, worrying, organising – and he takes this as evidence of conspiracy. He says it is organised secretly from behind the scenes by Israel. The story is that Israel is at the heart of a web of lies, spun to silence criticism of its human rights abuses. Everyone who ostensibly worries about antisemitism, says this story, is really only pretending; really they know it isn’t true; really they are in a conspiracy to get rid of Corbyn; not because he’s antisemitic, he isn’t; but because he opposes Israel’s cruelty. In this way Israel becomes the big powerful aggressor; and the Leader of her Majesty’s opposition and the resources of the whole Labour movement in Britain become the powerless victims. Antisemitism always portrays itself as the victim of the powerful Jews. Steven Sizer has been doing this for years. 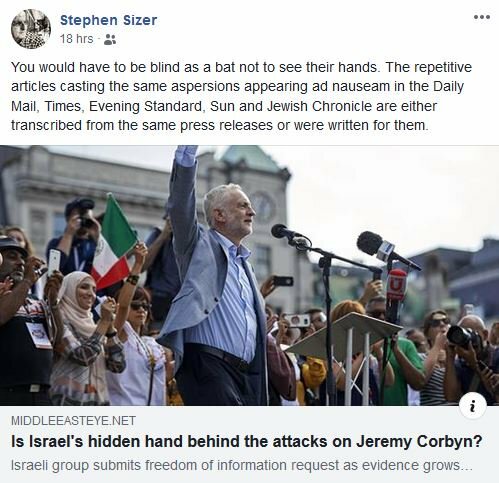 Sizer responded to an argument that BDS was antisemitic by alleging that the argument was made in bad faith ‘by the people in the shadows’, in order to unfairly de-legitimize criticism of Israel and the occupation. Towards the end of his life, the work of my teacher and friend Robert Fine came to focus more and more on the struggle within the left against antisemitism. This was continuous with his lifelong concern about the importance of what happened inside the left, and specifically the ever present tension between democratic and totalitarian thinking. Antisemitism has consistently been not only a threat to Jews but also a visible symptom of the rise of anti-democratic politics. Fine’s last book, written with Philip Spencer, was called ‘Antisemitism and the Left: On the return of the Jewish Question’. The answer, of course, is that antisemitism is never a response to what Jews do, it is caused by what antisemites do. Even when Jews do bad things, the work of transforming this into an antisemitic narrative is the responsibility of the antisemites. Sometimes Jews are held collectively responsible in subtle ways. For example, an assumption of guilt becomes the norm. Jews may be free to disavow, but already being Jewish in a political environment has become more difficult; and the precise nature and intensity of the required disavowal is sometimes beyond what Jews are willing and able, under duress, to offer. There is currently an unprecedented consensus within the Jewish community in Britain that there is a serious problem of antisemitism in the Labour Party and that Labour’s stubborn replacement of the IHRA definition with a home-made version is symbolic of that problem. The consensus reaches across the four main religious communities, Liberal, Reform, Masorti and Orthodox; the Jewish Leadership Council and the Board of Deputies, the Community Security Trust and the Union of Jewish Students; Jewish journalists like Hadley Freeman, Jonathan Freedland, David Aaronovitch, Nick Cohen and Daniel Finknelstein; Jewish scholars of antisemitism like David Seymour, Robert Fine, Philip Spencer, Anthony Julius, Simon Schama, Eve Garrard, Lesley Klaff; the three major Jewish newspapers speak with a single voice; Jewish Labour MPs such as Ruth Smeeth, Luciana Berger, Margaret Hodge, Ian Austen, Louise Ellman are in agreement. The voters of Barnet have twice told the party what they think in clear and unambiguous terms. There is also a small but noisy group of antizionist Jews, who mobilize their Jewish identities politically in the hope of amplifying their voices, who speak ‘asaJew’, who say they do not experience antisemitism and who are not able to sniff it around them. This is not a case of two Jews, three opinions, but of a united community and a tiny oppositional faction. How did Judge Macpherson help us to make sense of this kind of situation? He did not say that if somebody says they experience racism it must be true; neither did he say that victims of racism have the right to define their own oppression. But he did say that victims of racism should be taken seriously. There should be an initial presumption that their view is right. A standpoint is not simply an interested position (interpreted as bias) but is interested in the sense of being engaged . . . . A standpoint . . . carries with it the contention that there are some perspectives on society from which, however well-intentioned one may be, the real relations of humans with each other and with the natural world are not visible. But ‘The Jewish Question’ begins with the opposite presumption, that one should start by assuming that the Jews, at least those who refuse to disavow Israel, are up to something sly when they say they experience antisemitism. Sometimes Jews are accused of being ‘hysterical’, as the President of the Board of Deputies was by a veteran Jewish socialist in a recent radio debate; there is a long antisemtic tradition of the misogynistic ridiculing of Jews; we are accused of being shrill or paranoid. But more often we are accused of the opposite: being calculating and dishonest. The standard response to Jews is not that they have misjudged the situation, perhaps for understandable reasons related to their history. Most British Jews after all, are descended from those who tended to worry about antisemitism; European Jews who assumed that everything would turn out fine don’t have many descendants. The standard response to Jews is that they know that their claims of having experienced antisemitism are false, and they persist in making them anyway for selfish tribal reasons. It is a nasty little trick to silence the voice of the Palestinians and to smear their great supporter Jeremy Corbyn. The debate about antisemtism, in this view, is just an underhand way of trying to win the Israel-Palestine debate. Moreover this is the charge made against the community as a whole, not only against particular individuals. It is the community as a whole which is accused of ‘pouring petrol on the fire’ or of orchestrating a ‘cynical attempt to challenge Jeremy Corbyn’s leadership’. Make no mistake, the charge against the Jewish community is that it is involved in a conspiracy against the left. Any individual could get it wrong. But when a whole community gets it wrong together, in an organised and co-ordinated way, and in bad faith, then the allegation is one of Jewish conspiracy to lie and to smear. More and more, antisemitism, racism and xenophobia are portrayed as the cry of the oppressed while antiracism is constructed as a discourse of power, mobilized by a cosmopolitan global (neo)liberal elite to silence that voice and keep the oppressed down. A small number of antizionist Jews, constantly re-branding themselves into organisations with new names, make it their central political work to give evidence against the Jewish community and to explain to non-Jews how its claim that antisemitism is a serious problem in the Party is in fact fabricated. If I was a non-Jewish socialist who had been educated into antisemtic ways of thinking by Jews, I would be furious when I found out what had happened. The effect of the construction of a ‘Jewish Question’ is particularly marked in its effect on left wing Jews. When Peter Willsman bombastically declared that he wasn’t going to be lectured by Trump fanatics with no evidence, he was also talking about Labour Jews. It is after all us who have been at the forefront of the battle against the antisemtism which was imported into the centre of our party by the Corbyn faction. Labour Jews know even more clearly and intimately what Labour antisemitism is like than Trump supporting Jews do. And I can tell Peter Willsman one thing very clearly: not one of us Labour Jews supports Trump. Not one of us. But we are used to what ‘The Jewish Question’ does to us. It constructs us as belonging to the Jewish community which follows the Trump line; or the Tory line or the Blairite line or the neoliberal or neocon line. We are not heard as ourselves but only as spokespeople for Jewry. It makes us aliens in the Labour movement, on the left, in the unions and in sociology departments. It puts us outside of the community of the good, of comradely debate and of rational discussion. Young people on today’s left are being educated to recognise those who raise the issue of antisemitism as being more hostile to progressive politics than those who themselves slip into antisemitism. In this way, left wing and democratic Jews are being excluded from their political community and are being made politically homeless. Antisemites have always positioned themselves as victims of the Jews; Corbyn is positioned as the victim of Margaret Hodge and Ian Austen, who are disciplined as though they are agressors, for speaking out against antisemitism. Skwakbox, a supporting voice of the ruling faction, tweeted that ‘The Jewish War against Corbyn risks bringing real antisemitism to Britain’. Imagine people on the left in any other context being unable to understand and de-code such threatening victim-blaming. Jeremy Corbyn responds by repeating, in general terms, his opposition to antisemitism. But what he is not able to do is to demonstrate that he understands what contemporary left wing antiemitism is. In particular he is not able to make the link between his own politics of trenchant and often irrationally overblown hostility to Israel, and the appearance of those examples of antisemitism amongst his supporters which everybody can recognise as antisemitic. This debate makes no sense if we do not talk about Corbyn’s own record of siding with antisemites, of offering political support to antisemites and of making alliances with antisemites; of considering some kinds of antisemites to be part of the global struggle against oppression. Whatever the ‘true’ aggressor is named, be it capitalism, imperialism or modernity, it is considered responsible for war, poverty, famine and alienation; and anybody who opposes it, even if they are antisemtic, are considered to be on the progressive side. And then Israel is positioned as being a key element to that global structure of violence and oppression. And the democratic states are positioned as global exploiters and aggressors. Corbyn has been paid to make propaganda on Press TV in English for the Iranian regime; he has used that platform to say that he sees ‘the hand of Israel’ behind Jihadi terrorism in Egypt when we know that it is Iran which finances Jihadi terrorism across the region; he has used that platform to complain that the BBC is biased, in particular in favour of the view that Israel has the right to exist; as though there was something inappropriate about that. Cobyn has jumped to the defence of Raed Salah, the man who mobilized medieval blood libel against Jews, saying that he was not dangerous; and he has jumped to the defence of Stephen Sizer, who claims Israel was behind 9/11, portraying him as the victim of a Zionist smear; and he has supported the ostensibly pro-Palestinian campaign of Holocaust denier Paul Eissen, claiming that Eissen’s politics were not public knowledge at the time. Corbyn sided with those responsible for the Nazi-style mural which showed Jewish caricatures getting rich off the back of the workers. Corybn famously referred to Hamas and Hezbollah and ‘friends’, but more damningly, in the same speech, he judged those Jew-hating organisations to be dedicated to peace, to the good of the Palestinian people, and to political and social justice. If somebody claimed that the KKK was dedicated to the good of the US South, we would have no problem in reading that as a statement of political support for the Klan. On Holocaust Memorial Day Jeremy Corbyn booked a room in Parliament for an alternative event which would take the spotlight off the Holocaust and other genocides and instead make the case for the claim that Jews are the new Nazis and that Gaza is run by Israel like a piece of Nazi genocidal infrastructure. The list goes on. Jeremy Corbyn needs to account for his own political history in relation to antisemitism. He needs to explain why he got these things wrong and what he has learnt from it. But he stubbornly refuses, offering instead watery politicians’ apologies for offence caused. He doesn’t only need to apologize to Jews he needs to apologize to the Labour Party and to the British electorate. The farce of botching up a home-made definition of antisemitism to allow Labour people to continue to do things which are internationally recognised as antisemitic is embarrassing. The Labour claim that no rhetoric against Israel could be antisemitic in the absence of antisemitic intent is a break with antiracist scholarship and activist practice. Macpherson dealt with this decades ago. When he said there was a problem of institutional racism in the Metropolitan Police, he specifically did not mean that individual officers were guilty of racist intent. He made clear and explicit what we all knew, which was that racism appears as norms, as practice, as politics, as discourse, as ways of doing things, as ways of thinking and as canteen culture. The examples of antisemtism which we can all recognise in our party (the pockets, as our leader called them) are connected to the politics which have moved into the centre of our movement from the periphery, and of which Jeremy Corbyn himself, and his ex Communist Party advisors, Seumas Milne and Andrew Murray, are symbolic. Like a Police Federation rep from 1982, Jeremy Corbyn keeps on saying that if there are any antisemites, he will expel them; there’s a bad apple in every barrel, and not just in ours. But political antisemitism is an objective, external social phenomenon, not just a moral corruption inside the souls of some bad individuals. And there is a specific and authentically left wing tradition of political antisemitism which is not seen in other places. The IHRA definition is not perfect but the quest for textual perfection is misplaced. It is quite explicitly not a substitute for political judgment. When it says, for example, that comparing Israel to Nazis may be antisemitic, it is clear that this is a judgment which must be made, depending on the complex interaction of context, intent, how the action is understood and what effect it might have. IHRA is a political document which takes account of the fact that there is a long, and currently strong, tradition of left wing antisemitism. There have been claims that IHRA chills free speech and in particular that it interferes with Palestinians’ rights to define their own oppression. This is quite wrong. Diverse Palestinians are free to define their oppression as they see fit, some in antiracist terms and some in the antisemitic terms of the Hamas charter; but if they want to be members of the Labour Party then they are not free to define their oppression in antisemitic terms. But it is not Palestinians, by and large, who are responsible for the antisemitic rhetoric and exclusions in our movement; it is more often those who are drawn towards expressing their feelings of anger against Jews, than those who are doing the hard work of solidarity with people in the Middle East, people who are for peace, who are for the Labour movement, and who are against racism and antisemitism. The most committed Palestine Solidarity activist I have ever known, John Strawson, who taught law for years at Birzeit University in the West Bank, has recently resigned from the Labour Party in disgust at its political culture of antisemitism. We need to think about why we are no longer able to provide people like him with a political home. More and more we are seeing people on the right declaring that the real problem of antisemitism comes from the left and from Muslims; and this is answered by people on the left stating that the real threat of antisemitism is to be found in European and American right wing populism. Everybody points at the people whose politics they already hate, and they say: ‘The real problem is over there!’ But of course, we all need to start over here, within our own political family. Never has it been more important for Labour to embrace democratic politics but never has its anti-democratic tradition been more to the fore. We should understand antisemitism as a warning about our own movement, not as a fiction invented by alien and right wing Jews. We might soon find ourselves with the job of clearing up the disaster of Brexit; we might find ourselves in a straight fight with a Boris Johnson, full-Trump, Tory Party. The stakes could not be higher and we have to get ourselves into shape for a defence of democratic life. Jeremy Corbyn’s underwhelming response to concerns about antisemitism. I have spent my life campaigning for recognition of the strength of a multicultural society. before moving on to some platitudinous remarks about the Jewish contribution to Britain. So no one can, or should, try to dismiss or belittle the concerns expressed by so many Jewish people and organisations about what has been happening in the party I am proud to lead. I do not for one moment accept that a Labour government would represent any kind of threat, let alone an “existential threat”, to Jewish life in Britain, as three Jewish newspapers recently claimed. That is the kind of overheated rhetoric that can surface during emotional political debates. I want to go further. I want Jewish people to feel at home in the Labour party and be able to play their full part in our work to take our country forward. And I appreciate that this cannot happen while antisemitic attitudes still surface within Labour, and while trust between our party and the community is at such a low ebb. The problem isn’t really that ‘antisemitic attitudes still surface’ – that’s almost bound to happen from time to time, just as it does in the Conservative Party. What matters more is how these issues are dealt with and what kind of steer is given by the leadership. We’ve seen how Labour has dragged its feet over dealing with individual instances of antisemitism, and how senior Labour figures such as Chris Williamson have only compounded the problem by questioning the integrity of those raising concerns. The Holocaust was the greatest crime of the 20th century. Jewish people who are feeling concerned must be listened to. And we would not be socialists if we were not prepared to go the extra mile and beyond to address Jewish concerns. Corbyn goes on to offer a weaselly explanation for revising the IHRA definition of antisemitism. Our code is a good faith attempt to contextualise those examples and make them legally watertight for use as part of our disciplinary procedures, as well as to draw on additional instances of antisemitism. Although Corbyn does at least acknowledge there should have been more consultation with the Jewish community his summary of what was changed is misleading. Our actual differences are in fact very small – they really amount to half of one example out of 11, touching on free speech in relation to Israel. Here’s the thing… if people blaming 9/11 on Israel have ‘no place in the Labour party’ … can someone who blamed an Islamist terror attack against Egypt on Israel have a place in the Labour party? No wonder he prefers to stick to warm and fuzzy generalities. In the 1970s some on the left mistakenly argued that “Zionism is racism”. That was wrong, but to assert that “anti-Zionism is racism” now is wrong too. It’s difficult to imagine many people, formerly sceptical, will have their minds changed by this piece – particularly as a substantial section was copied word for word from an article which appeared in the Standard back in April. People who dish out antisemitic poison need to understand: you do not do it in my name. You are not my supporters and have no place in our movement. It’s sort of good that he said that the antisemites don’t act in his name… I wish he’d said that the people who deny the scale of the antisemitism don’t act in his name too. Cos a lot of them think they do. And he’s given them reason to think they do. This piece, by John Strawson, is from Jewish News. This week I left the Labour Party due to the failure of the National Executive Committee to adopt the full International Holocaust Remembrance Alliance (IHRA) definition and examples of anti-Semitism. Despite the pleadings of the Jewish community, the Labour Party instead arrogantly adopted its definition which effectively licenses forms of anti-Semitism. It created a test of anti-Semitic “intent,” not in the IHRA definition, which would be difficult to prove while allowing for comparisons to be made between the Israel and the Nazis. Worse, if this were possible, it would allow members to claim that the creation of Israel itself was a racist endeavour. For me this was crossing a line and transformed the party I had been a member for decades into an institutionally anti-Semitic organisation. The Labour party leadership claims that the reason for the not adopting the full IHRA definition and examples is because it wants to ensure free speech on Israel and Palestine. As a staunch supporter of Palestinian self-determination and an opponent of the Israeli occupation of Palestinian territory after the 1967 war, I regularly criticise Israeli policy. For a period of 11 years I was involved in a European project supporting Birzeit University’s Institute of Law. I was a visiting professor teaching at the Institute and participating in conferences several times a year. I was there during the worst of the second Intifada and I know something about how dreadful the humiliations and oppression of occupation are. I agree with the International Court of Justice that the wall that has been built on Palestinian territory is illegal. However, I can make all these criticisms without resorting to anti-Semitism or calling for the destruction of Israel. In any event anti-Semitism hardly aids the cause of the Palestinians. There is also another fundamental principle; the creation of the Israel was ethically correct. The Marxist Isaac Deutscher called it a “historic necessity.” As the United Nations partition plan recognised, Jews, have the right to self-determination. The rationale for Israel was the profound anti-Semitism that ran through the sinews of Europe over centuries. Those who support Boycott, Disinvestment and Sanctions (BDS) often attack Israel as a racist state – something the Labour party definition would allow – but Israel is not a racist state, it is a refugee state. In the last three years the Labour party has become the largest organisation circulating anti-Semitism. I now understand that what he actually meant was that anti-Semitism would be eliminated by a weaker definition.